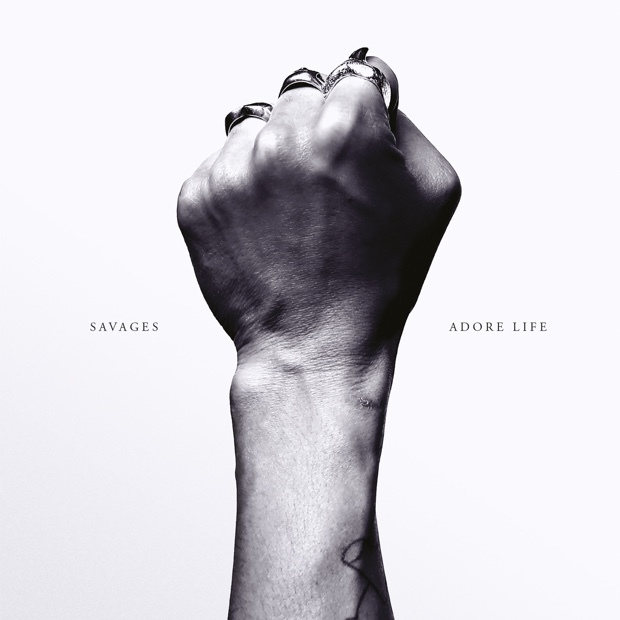 Savages burst onto the stage in fiery fashion with their debut album Silence Yourself back in 2013 and with it they injected new life into what people agree on being as a fusion of Post Punk and Noise Rock. It was a truly modern rock album and with it they demonstrated that Guitar music was not dead and buried just yet, at least not with them. The bold and aggressive revelations both musically and lyrically should have seen them receive greater recognition, but alas with Adore Life there is another opportunity for the quartet to confirm their talent and that they’re here to stay. ‘The Answer’ sees them utilising their punk riffs reverberating around the crashing percussion and Jehnny Beth’s alert and siren-like vocals that sing in a detached fashion from the musical forms around her. The vocals act almost as a counter melody to the music. Both the vocals and instrumentation remain unrelenting in dragging you through the song’s progression. One key point here is the more washed out effects over the guitars which is the main shift away from the isolated sounds of their debut Silence Yourself. ‘T.I.W.Y.G’ is much more direct and immediate than the first single and is a little more reminiscent of their earlier work with seething percussion which folds into a similarly aggressive bass-line. Emerging from this rumble are the perfectly poised riffs echoing out from the narrow sound. One key difference with this track is its unrelenting, yet tuneful rhythm and a more distorted feel to the sound, particularly the bass-line. ‘Adore’ sees them take it down a notch and deliver a dark and melancholy tune. The slow twitching of the bass and strong reverberating echo of the guitars. Through this emerges Jehnny Beth’s distinctive, melodic roar as the notes rise, but retaining a composed and eerily gentle tone through most of the song. The simplistic nature of the song and the arrangement makes the lyrics of human vulnerability ring out in an emphatic fashion. Beyond that, the song is a beautiful work for it’s minimalism and the understated power running through it. ‘Evil’ is evocative of their earlier work in terms of the general structure, but it is more minimalistic in its delivery, yet fills up the wide spaces they create. The production in this sense compliments their sound perfectly here to generate a song of urgency, but of depth too. ‘I Need Something New’ is almost a rapidly delivered poem with the music acting a reactionary element to the performance. Jehnny’s vocal range fires from the heights and depths with great power. ‘Surrender’ introduces itself a heavily distorted fashion as the guitar and bass groans through the effects. Through this are lighter synths and of course the booming vocals; these shine through in the chorus. It is a track with rougher edges and a hardened attitude. ‘Mechanics’ features a dark and mysterious aesthetic with carefully placed reverberating guitars and echoed bass lines. The track ends an album that is varied in it’s moments of contemplation and focussed rage. At times it is cleaner and clearer with the production but at others it is rough edged and distorted. These highlight the sparse moments and the energetic moments.